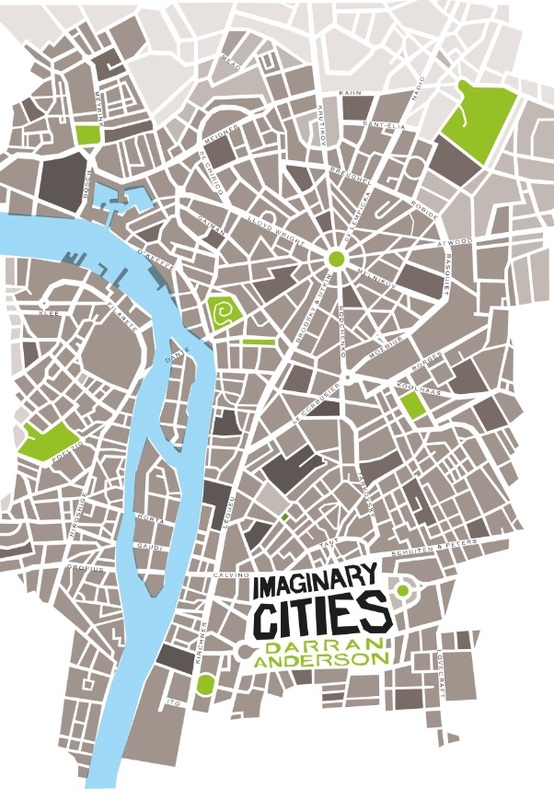 Darran Anderson’s Imaginary Cities (Influx Press) is a sprawling, epic pyschogeographic exploration of our relationships with cities, both real and imagined. With a frame of reference which takes in everything from Marco Polo to Judge Dredd, the book is a breathtakingly ambitious piece of creative non-fiction, told with wit, insight, and energy. Anderson is a former co-editor of The Honest Ulsterman, and is also the author of a 33 1/3 study of Histoire de Melody Nelson by Serge Gainsbourg. His forthcoming memoir, Tidewrack, about the river Foyle in Derry, will be published by Chatto & Windus. If I have I’m not sure it was a conscious decision. I was brought up by hippies, who were somewhere between the cast of Jesus Christ Superstar and the Baader-Meinhof Gang, so the only way to rebel would’ve been to not rebel. When I was about 8 or 9, I wanted to have short hair in contrast to everyone around me. I remember seeing Talking Heads on TV at the time and idolising David Byrne because he looked refreshingly square wearing a suit. Whatever expectations my family had of me weren’t dreary though, quite the contrary. Dreary would’ve been easy, straightforward. There’s a tendency in literature to write about the banality of bourgeois existence. To be honest, that would’ve been quite a welcome issue to deal with. I grew up in Derry during the last third of the Troubles and went to a Catholic boys’ school so you had, to varying degrees of malice, the priests, the police and the army to deal with, to say nothing of paramilitaries lurking in the background. So there was no shortage of pricks to kick against. What I realised early on is how exhausting that is and how you’re defined and trapped by the things you rail against. You can beat yourself to pieces against those in power. And it can “make a stone of the heart” in the process as Yeats put it. The alternative was to create spaces that were yours, that they couldn’t reach, whether that’s hanging out in abandoned buildings as we did as kids, or starting your own nights, forming bands and immersing yourself in music, art and books as we did later on. That seemed the best form of rebellion against puritanical shrivs. An instinctive joyful kind of defiance. Everything I’ve done since has come out of that. My generation had the relative breathing space for that to be an option. Our parents and grandparents, by contrast, were swallowed up in the conflict. Being part of a liminal generation placed us in the awkward but interesting position of being unintentional witnesses, one step removed. My forthcoming book Tidewrack is written from that viewpoint and about that period, but going right back to the 1930s. It’s an attempt to retrieve things that were lost in that time, partly because so many people were and now even the memories of them are fading. It seems premature to say. Maybe I’ll know what it all amounted to on my deathbed. Or someone else can work that out when we’re all gone, if any of it remains. I’ve always preferred ‘It Was a Very Good Year’ to be honest. There’s a saying I can relate to that ‘books aren’t finished, they’re abandoned’. Pride never really comes into it because you’re always thinking of what you could’ve done differently or what you’re going to do next. I think restlessness and doubt can be healthy things for a writer, if they’re kept from spiralling out of control. I’ve found indirect developments seem to matter most. It’s amazing to be translated into another language or published overseas so I’m really excited about the forthcoming French and U.S. editions of Imaginary Cities, with Éditions Inculte and University of Chicago Press respectively. And it’s a delight to have people acknowledge the influence of your work on their projects, as the team behind the forthcoming game Frozen Synapse 2 have kindly done for instance. That’s especially welcome when its people like architects, designers or programmers as I’m interested in the crossover areas between disciplines, which I think are overlooked and are hugely rewarding. Being asked to give talks, like the Venice Biennale last year, is always a pleasure. Saying all that, pride’s something I feel about other people rather than myself, especially the writers, editors and filmmakers I grew up parallel to and who are now doing well – Jenni Fagan, Susan Tomaselli, Adelle Stripe, Chris Kelly, Lee Rourke, Ben Myers and Christiana Spens above all. It restores some illusory sense of justice in an otherwise bereft world. The temptation is to say a book or a film or a near-death experience or something alone those lines and they existed but it doesn’t feel true. When I was about 17 or 18, I went to Barcelona and I remember wandering around, young and absurdly in love, and for the first time in my life, I felt like I was somewhere else, lost among this incredible history, culture and architecture, and it was awe-inspiring. Since then, exploring cities has become addictive. That depends on me being alive of course. For many years, I lived quite hedonistically and I’d pushed my luck far too many times. Meeting my wife Christiana at a reading in Clerkenwell and then meeting our boy when he was born years later has been a real turning point. The depth of feeling you get is almost overwhelming and yet there’s a real stoicism to it. It’s not a surprise that for fifteen years I wrote loads of unpublished books and worked on lots of hare-brained projects that would self-destruct at the last minute but now there’s a sense of purpose and immediacy to it all. sexiness, how would you describe yourself? There would have to be some serious methods of compulsion involved. I like hip-hop a lot but the world would not thank me for dabbling in it. I’m not one for boasts. They seem an expression of insecurity. If you need to call attention to something, it’s probably lacking in some way. I’d settle for some music. Words are overrated. There’s an odd thing about integrity. We assume we innately have it and then give it away. You sell your soul because you possess one to begin with. I’m not sure that’s the case. The people I’ve encountered who have real integrity seem to have worked hard to get it. I grew up working class and remain that way so I haven’t really been asked to sacrifice anything because there hasn’t been that much to sacrifice, apart from, unavoidably, time and effort. Obviously there are continual negotiations with compromise; that’s the way of the world unfortunately. Perhaps there are other forms of integrity; looking after the people you love, continuing to do what’s worth doing. I wouldn’t go as far as Brecht in saying “Food first, morals later” but many people I’ve seen making valiant public stands can afford to do that. There’s a piety often involved in talk about wealth that I’m resistant to. Give me Machiavelli any day over Mother Theresa. Offering the poor the dubious consolation of authenticity has always seemed to me to be a shoddy deal. If you haven’t a pot to piss in, integrity isn’t really one of your main concerns. Finding a pot to piss in is. It’s important to be able to look at yourself in the mirror undoubtedly but there are other considerations that are just as vital. Werner Herzog, without question. I try to have influences outside of literature so I don’t just repeat what another author has written, and curious things happen in translation from one medium to another. There’s a danger with Herzog’s popularity online as a kind of meme mine, with that deadpan Bavarian voice and his dark humour, that his actual films are obscured or forgotten. I return to them endlessly, and his book Of Walking in Ice. There are half a dozen masterpieces but even the minor short films or the more flawed movies are worth examining again and again. There are so many transcendent moments hidden away in those. It’s like exploring a planet, which is essentially what he’s done. There’s an insatiable curiosity there that really appeals to me and which I try to follow. And the way he has these small moments of everyday surrealism, often extracted from unlikely sources, next to a sudden broadening out into the Sublime of the natural world. It’s magnificent. It even feeds into your life, outside of writing. The idea of going out and finding strange things or sanctuaries. Looking at the world differently. I’ve gone up into mountains to find ghost towns and been in the jungle and placed messages in bottles in a dozen rivers. I’ve explored abandoned factories and aircraft hangars and underground chambers and it comes from Herzog rather than traditions of urban exploration. With Tarkovsky, Bergman or Kurosawa, their genius is colossal but because of that you can’t begin to emulate them. There’s too much weight involved. Where would you begin? With Herzog, you can at least start, because he began as an auto-didact who stole his first camera. You can conceivably follow his example, not necessarily in his direction but elsewhere. For that, I’ll always be indebted to the man. In terms of public personalities I’d least like to be, I used to work in a job that meant speaking to very rich British people every day for years on end, a significant number of whom were leading celebrities (famous actors, football managers, tv presenters etc). I’ve seen behind the curtain and it’s truly grim. Just turn on primetime television and pick any of them at random, generally the more affable they are on screen the more insufferable and wilfully unpleasant they are in reality. That’s who I don’t want to be. A compass. A torch. A machete. A notepad and pen. Some kind of communication device to try and radio back. Maybe a fire extinguisher in case I’m heading downstairs. A lifetime of good memories in case I’m in limbo. Abseiling ropes in the unlikely event of heaven. I used to cover the walls and roof of my room, many rooms actually in different cities, with paintings cut out of books: Feininger, Klee, Munch, Picasso’s Blue Period, Höch, Schiele, Modigliani, Bosch, Der Blaue Reiter, Vermeer, Klimt, the Delaunays, all sorts of things. I was a nauseatingly-intense young man. It served as a kind of prompt for writing, a refuge when things were turbulent, and I still wanted to be an artist despite knowing I wasn’t remotely talented enough. There were lots of portraits among those and I’d go through phases of being fixated on certain ones; the mysteries hidden in Jan van Eyck’s work for instance and how his portraits when you strip away the clothes and surroundings look incredibly modern. The one that says the most to me isn’t necessarily my favourite but it is remarkable. I thought at one stage I was a teenage Futurist, making collages, but it turns out I was laughably-mistaken. Umberto Boccioni’s ‘Simultaneous Visions’ has always stayed with me though. It’s of a person looking out onto a street from a high window. You see their face, their reflection and the city below, all somehow merging. It reminds us of the simultaneity of cities, the temporal as well as spatial aspect to them, how our experiences are subjective but more than that how our surroundings seep into us and vice versa. We’re continually trying to stand apart from a world which we’re intrinsically part of. There’s no escaping it. Boccioni reminds us that this is not necessarily a bad thing. We’re not just immersed in the world, we’re of the world. It’s a continual reminder, when undertaking an activity as solitary as writing, to dive back in. Posted in Interviews and tagged Darran Anderson, Imaginary CIties, momus questionnaire. Bookmark the permalink.